You know it’s been a good 10 days when you’ve made five consecutive batches of ice cream and the freezer is empty. It began with a friend in training for a half-marathon and a recipe for gorgonzola dolce ice cream with candied walnuts. Ready to indulge after our run we took to the kitchen with milk, cream, sugar, and a small but very expensive slice of cheese, only to have the base boil over during a moment of enthusiastic negligence. I should mention here that Lauren and I are optimists by trade, the kind who declare that burnt walnuts are “masked by the gorgonzola,” and ice cream that refuses to thicken “just needs another hour in the freezer.” After two hours it was still sweet, delicious sludge, but we slurped every last drop from the Tupperware in five minutes flat. I’ve learned a few things about “optimistic cooking.” It frequently involves substitutions, additions and overhauls. It renders recipes suggestive rather than imperative (“this was supposed to be made yesterday and sit overnight? I can put it in the fridge for an hour…”) and it infuriates the precise cooks among us (“you mean you only have one tablespoon of cream cheese? This calls for three!”). The outcomes generally waver between mediocre and transcendent. In my own optimistic way I’ve come to see it as a metaphor: even when you follow a recipe to the Nth degree, sometimes it still turns out wrong. In food as in life we have no ultimate control, and that can be annoying, terrifying or the source of all our best discoveries. So it was that I began making chocolate ice cream (“The Darkest Chocolate Ice Cream in the World,” if you must know) only to realize I didn’t have nearly enough cocoa. 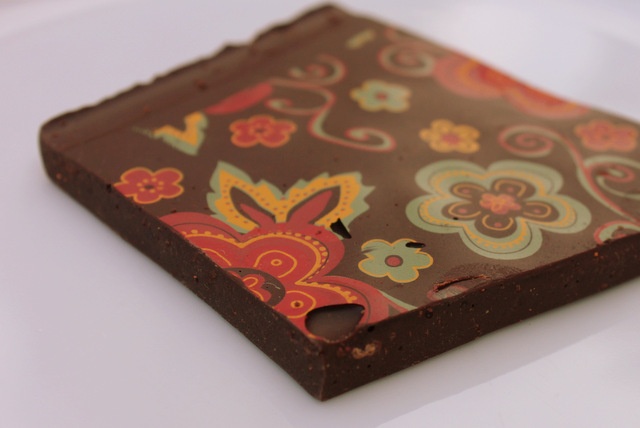 What I did have was a packet of Mayan cocoa, a blend of the original with chilies and cinnamon. With a small (mental) shrug I made the switch, and when I tasted the results I made a rather earth-shattering discovery—I am no longer a vanilla person. Chocolate ice cream this good necessitated a second batch, then a third. It was consumed alone (guiltily from the Tupperware) and with Lauren (from the Tupperware, but not as guiltily—oh the joys of friendship!). And it led to a small epiphany—ice cream can get you far (say, re-tweeted by your favorite celebrity) but optimism can get you farther. My favorite cookbook of last year? Jeni’s Splendid Ice Creams at Home (yes, this is probably the fourth time I’ve mentioned it). 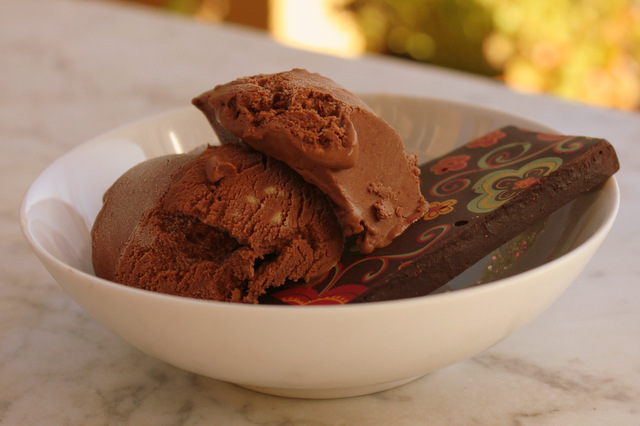 I adapted her recipe for “The Darkest Chocolate Ice Cream in the World” using Mayan spiced cocoa, but you can use good quality unsweetened cocoa with cinnamon and cayenne or ground Mexican chiles. And in case you’re wondering where that beautiful slab of chocolate comes from… Trufflehound’s in Ventura is my new favorite spot! To make the chocolate syrup, combine the regular cocoa powder, Mayan cocoa powder, brewed coffee and brown sugar. Bring to a boil over medium heat and boil for 30 seconds, stirring frequently until thick. Turn off heat and break the chocolate into the sauce, letting the pieces sit for a minute or so until they melt. Whisk the sauce until smooth. Pour into a large bowl and add the cream cheese, stirring until completely combined. To make the ice cream base, dissolve the cornstarch in 2 tablespoons of milk in a small bowl. Combine the milk, cream, salt and brown sugar in a saucepan and bring to a boil over medium heat. When the mixture begins to bubble, set a timing for four minutes and simmer while stirring to prevent the base from boiling over. After four minutes turn off the heat and add the cornstarch, then return to a boil for one minute more. Pour the hot milk mixture into the bowl with the chocolate syrup and whisk to combine. 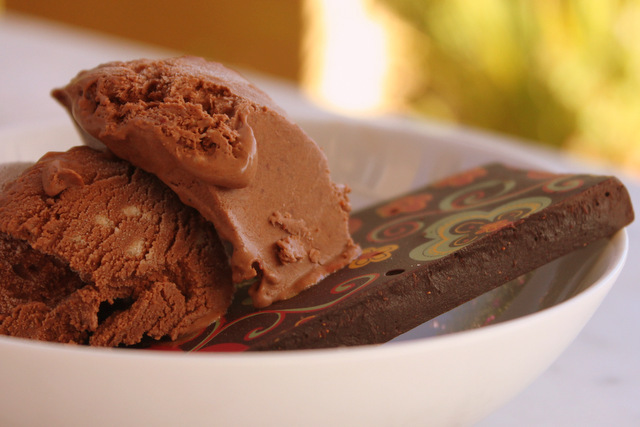 Chill the ice cream base until completely cold, then freeze in your ice cream maker. Store in the freezer, and beware of cracking the bottom of the Tupperware as you dig for the last few bites. Eating seasonally is a fraught issue. Even as someone who lives within spitting distance of California’s fields and worked on a farm in one of the biggest agricultural communities in the US, I still find myself standing in a supermarket aisle realizing seasonal eating can easily fall in the “it-sounds-so-nice-but-what-does-it-mean” category. But the last two weeks brought fresh insights, most of them born from the sweat of my mother and grandparents’ brows and my own tendency towards frugality. It’s not that I don’t love grocery shopping—one of life’s true joys–but with the rest of my family out of town (and an accidental purchase of a $17 bag of cherries from Whole Foods) I decided I was going to embark on several weeks of eating close to home. I admit—I held off on this post for a while because the things I was eating just seemed so simple. I should get more creative, I thought, come up with something special tonight. My resolve held firm through the morning, but come 11:30 a.m. I’d be standing at the stove sautéing the same slices of zucchini, and by dinnertime I’d be wandering beer-in-hand through the garden snapping off leaves of kale to make my favorite kale slaw with our ripe avocados. My conclusion? Eating seasonally, healthfully and startlingly cheaply really just requires three things: a bulk supply of a bountiful fruit or vegetable from your garden or nearby market, a great simple recipe (think six ingredients or less), and the willingness to enjoy (many) variations on the same meal. It may sound silly, but the prospect of dozens of zucchinis per week for the duration of the summer actually excites me to no end—I love crispy slices of spiced sautéed zucchini hot from the pan, and I’ll eat them daily much in the same way that I ate roasted cauliflower with lemon and tahini in the spring, or will eat grilled cherry tomatoes tossed with grains and salads next month. And yes, when I desperately crave cherries I won’t berate myself for indulging in a bag from the store. I’ll just check the per pound price first. 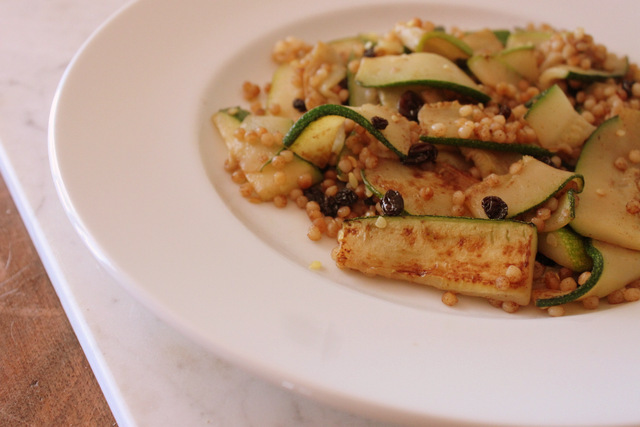 This recipe is endlessly adaptable – once you’ve sauteed the zucchini with the cinnamon and currants, feel free to get creative with your favorite grain. If you have good cheese like ricotta salata on hand add that in as well for a tasty lunch or summery side. Heat your pan over medium heat and add a good glug of olive oil. Slice the zucchini into thin ribbons and add to the hot pan, doing your best to arrange the strips so they don’t overlap. Sprinkle with salt and cinnamon. When the first side is browned flip the zucchini piece by piece (or, if you’re lazy, just give the pan a big shake) and sprinkle with a bit more cinnamon. 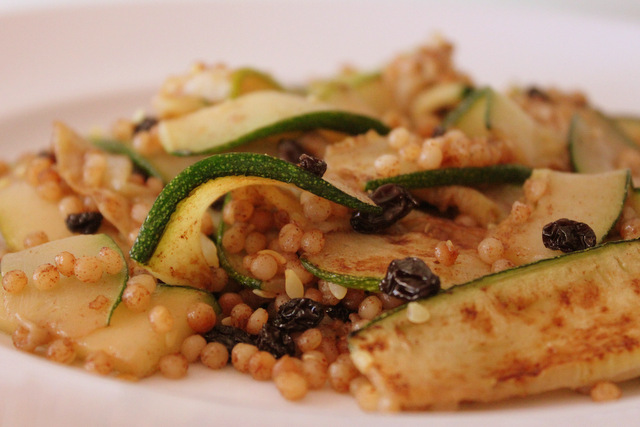 Cook until the other side is done, then add the currants and cooked Israeli couscous and stir fry with the zucchini for a few more minutes. Enjoy hot from the pan or cooled to room temperature. Get email updates from Girl Farm Kitchen!